Cheaper than the X1950 Pro - but potentially as powerful? 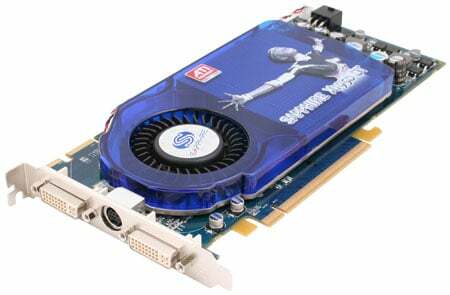 Review AMD launched the ATI Radeon X1950 Pro at the end of 2006, pitching it as a cut-down version of the X1950 XTX. It's now come up with a cheaper version, the X1950 GT, taking the technology below - well, just - the £100 mark. The Pro uses 12 of the 16 pixel processing pipelines - all in groups of four 'quads' - available in the XTX. The X1950 family has three shaders per pipeline so the XTX has 48 shaders and 16 texture units, while the Pro has 36 shaders and 12 texture units. The Pro's core and memory clock speeds were reduced from the heady 650MHz/2000MHz of the XTX to 575MHz/1400MHz. The Pro also gained an interesting new feature in the shape of internal CrossFire connectors that look very similar to the SLI connectors that Nvidia has used from day one. The only difference is that SLI has one bridge while CrossFire 2 has two of them so every graphics card can be supplied with a single bridge and when you buy a second card you automatically have the two cards and two bridges that you require for dual-card gaming power. The GT uses the same 80nm RV570 graphics chip that was used in the Pro except - so it too has 12 pipelines - that it has been clocked down to a core speed of 500MHz. Its memory that runs at a true 600MHz for an effective speed of 1200MHz. The GT is $20 cheaper than the Pro. As the Pro sells for around £109 over here, this means that we get the GT with 256MB of DDR 3 memory for £99. Put all these numbers together and you quickly see you’re getting about 85 per cent of the performance of the Pro for about 90 per cent of the cost, which sounds like a reasonable proposition, so let’s see how the GT performs, using a Sapphire X1950 GT as our sample of the class.